Every family has that dish that grandma is known for…this is mine. My mother’s mother always came to visit carrying two loaves. I usually lucked out and was allowed to pick which one I wanted. 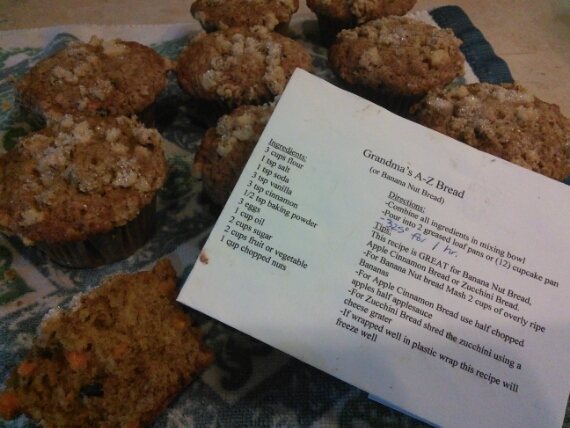 And I always picked her A-Z bread (usually banana nut or zucchini) over her pound cake (recipe to follow soon…promise). Both were delicious, but there was something about her banana nut bread with a smear of butter on it that was irresistible. This is one easy recipe that is a real winner, and since it makes two loaves…freeze one and it’ll be a hit twice for half the work. It really freezes well, nobody would even know. promise.